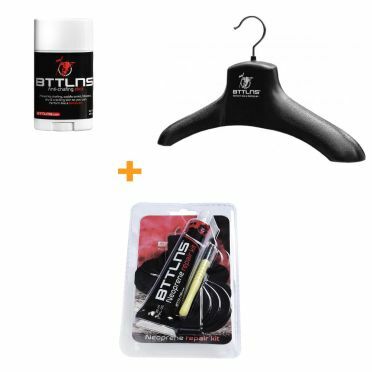 This BTTLNS Wetsuit accessories discount package consists of all the necessities you need to keep your wetsuit and yourself in top condition! 3 accessories that you as a swimmer can't miss when you often swim with a wetsuit. 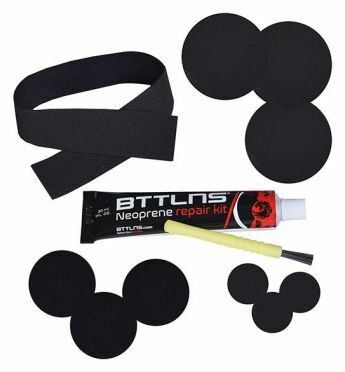 This discount package consists of a BTTLNS Wetsuit hanger, BTTLNS Neoprene glue and BTTLNS Anti blisters-chafing reflective black. 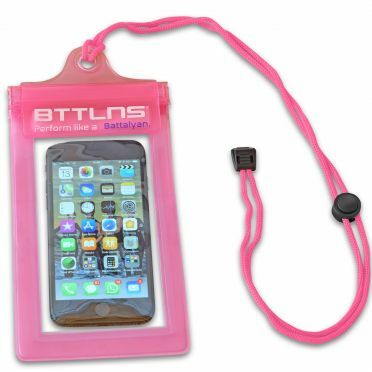 This BTTLNS Waterproof phone pouch Iscariot 1.0 pink is not only suitable for storing your smartphone but also for your; ID card, bank cards, keys, passport, money or whatever. Perfectly suited for various sports such as swimming, skiing, diving, but also for fishing, boating... in short all outdoor sports where you want to store your valuables in a waterproof way. 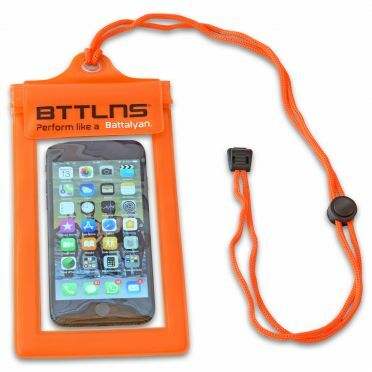 Bring your smartphone watertight to a depth of 4 meters, in a shower, in the mud or a blizzard. This waterproof storage bag of 20x10cm offers sufficient storage space for your accessories and is equipped with a easy drawstring to not lose your valuables. 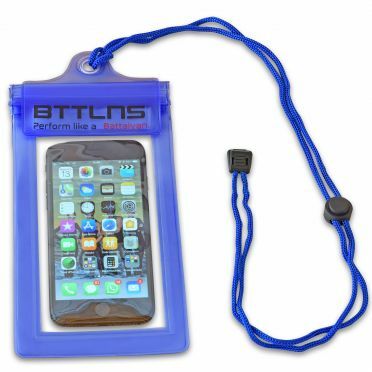 This BTTLNS Waterproof phone pouch Iscariot 1.0 blue is not only suitable for storing your smartphone but also for your; ID card, bank cards, passport, keys, money or whatever. Perfectly suited for various sports such as swimming, skiing, diving, but also for fishing, boating... in short all outdoor sports where you want to store your valuables in a waterproof way. 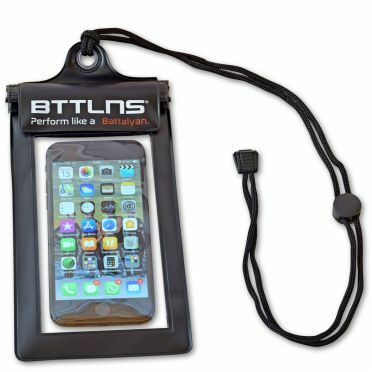 Bring your smartphone watertight to a depth of 4 meters, in a shower, in the mud or a blizzard. This waterproof storage bag of 20x10cm offers sufficient storage space for your accessories and is equipped with a easy drawstring to not lose your valuables. BTTLNS Led strips with batteries for Scamander saferswimmer: Extra 3-step eco-friendly security LED system for BTTLNS Scamander Saferswimmer with batteries. This set includes two LED strips with batteries! This brightly coloured inflatable BTTLNS Saferswimmer buoy dry bag 28 liter Poseidon 1.0 pink is ideal for storing your kit whilst you swim and to use as an inflatable buoy for increased visibility in open water. Since its launch in 2015 the product has received a high number of fantastic customers’ reviews and has become very popular among open water swimmers all over the world. 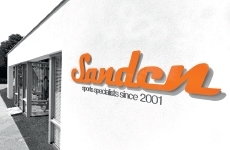 The product has also become popular with Swim-Runners who want to alternate consecutively between open water swimming and running as part of their training. 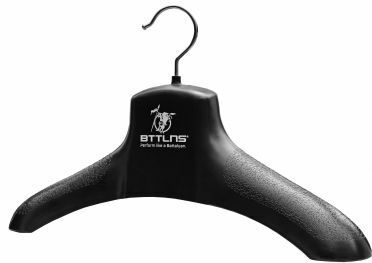 The BTTLNS dry bag features dual air bags, to beinflated once the bag is filled with training gear. A distinctive wetsuit due to a combination of maximum flexibility and super balanced buoyancy, the BTTLNS Gods used wetsuit Carnage 1.0 size MT! Developed with a NanoAerodome technology that ensures 30% more buoyancy, compared to conventional neoprene. Made of the most advanced neoprene material on the market on the shoulders and arms; Yamamoto #40 cell SCS neoprene for incredible flexibility and comfort. Completed with 2mm Pro-AeroFlow grippers, U-design silica gel holders and a Pro-YKK zipper, so you are not only wearing the fastest but also the most durable wetsuit! Size MT: length: 175-191 cm | weight: 68-78 kg | chest: 97-102 cm. Be careful: this model has small damage on the left leg by a nail (see picture 3) during a demo day, these are well repaired. A distinctive wetsuit due to a combination of maximum flexibility and super balanced buoyancy, the BTTLNS Gods demo wetsuit Carnage 1.0 size MT! 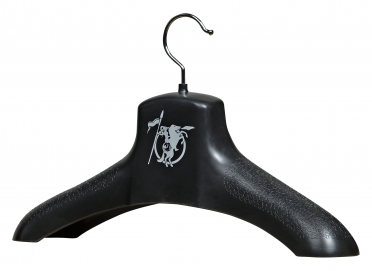 Developed with a NanoAerodome technology that ensures 30% more buoyancy, compared to conventional neoprene. Made of the most advanced neoprene material on the market on the shoulders and arms; Yamamoto #40 cell SCS neoprene for incredible flexibility and comfort. Completed with 2mm Pro-AeroFlow grippers, U-design silica gel holders and a Pro-YKK zipper, so you are not only wearing the fastest but also the most durable wetsuit! Size MT: length: 175-191 cm | weight: 68-78 kg | chest: 97-102 cm. Be careful: this model has been used during a demo day, but did not suffer any damage. A distinctive wetsuit due to a combination of maximum flexibility and super balanced buoyancy, the BTTLNS Gods demo wetsuit Carnage 1.0 size ML! Developed with a NanoAerodome technology that ensures 30% more buoyancy, compared to conventional neoprene. Made of the most advanced neoprene material on the market on the shoulders and arms; Yamamoto #40 cell SCS neoprene for incredible flexibility and comfort. Completed with 2mm Pro-AeroFlow grippers, U-design silica gel holders and a Pro-YKK zipper, so you are not only wearing the fastest but also the most durable wetsuit! Size ML: length: 165-181 cm | weight: 75-82 kg | chest: 102-107 cm. Be careful: this model has been used during a demo day, but did not suffer any damage. A distinctive wetsuit due to a combination of maximum flexibility and super balanced buoyancy, the BTTLNS Gods demo wetsuit Carnage 1.0 size L! Developed with a NanoAerodome technology that ensures 30% more buoyancy, compared to conventional neoprene. Made of the most advanced neoprene material on the market on the shoulders and arms; Yamamoto #40 cell SCS neoprene for incredible flexibility and comfort. Completed with 2mm Pro-AeroFlow grippers, U-design silica gel holders and a Pro-YKK zipper, so you are not only wearing the fastest but also the most durable wetsuit! Size L: length: 178-191 cm | weight: 82-92 kg | chest: 107-112 cm. Be careful: this model has small damage on the left shoulder by a nail (see picture 3) during a demo day, these are well repaired. A distinctive wetsuit due to a combination of maximum flexibility and super balanced buoyancy, the BTTLNS Gods demo wetsuit Carnage 1.0 size XXL! Developed with a NanoAerodome technology that ensures 30% more buoyancy, compared to conventional neoprene. Made of the most advanced neoprene material on the market on the shoulders and arms; Yamamoto #40 cell SCS neoprene for incredible flexibility and comfort. Completed with 2mm Pro-AeroFlow grippers, U-design silica gel holders and a Pro-YKK zipper, so you are not only wearing the fastest but also the most durable wetsuit! Size XXL: length: 183-196 cm | weight: 97-115 kg | brust: 117-127 cm. Be careful: this model has small damage on the left- and right leg by a nail (see pictures) during a demo day, these are well repaired.